Igor Sergeyevich Gouzenko (Russian: Игорь Сергеевич Гузенко [ˈiɡərʲ sʲɪrˈɡʲejɪvʲɪtɕ ɡʊˈzʲɛnkə]; Ukrainian: Ігор Сергійович Гузенко [ˈiɦor sɛrˈɦijovɪtʃ ɦuˈzɛnko]; January 13, 1919 – June 28, 1982) was a cipher clerk for the Soviet embassy to Canada in Ottawa, Ontario. He defected on September 5, 1945—just three days after the end of World War II—with 109 documents on Soviet espionage activities in the West. This forced Prime Minister Mackenzie King to call a Royal Commission to investigate espionage in Canada. Gouzenko exposed Joseph Stalin's efforts to steal nuclear secrets, and the technique of planting sleeper agents. The "Gouzenko Affair" is often credited as a triggering event of the Cold War, with historian Jack Granatstein stating it was "the beginning of the Cold War for public opinion" and journalist Robert Fulford writing he was "absolutely certain the Cold War began in Ottawa". The New York Times described Gouzenko's actions as having "awakened the people of North America to the magnitude and the danger of Soviet espionage". Gouzenko was born to a Ukrainian family on January 13, 1919, in the village of Rogachev near Dmitrov, Moscow Governorate (now Moscow Oblast), 100 kilometers north-west of Moscow, he was the youngest of three children. Igor's father was not present in his early life. Igor attended the Moscow Architectural Institute. While at the institute he met his future wife Svetlana (Anna) Gouseva; the couple married soon after meeting. At the start of World War II, he joined the military where he trained for a year as a cipher clerk. His position gave him knowledge of Soviet espionage activities in the West. Gouzenko worked under the leadership of Colonel Nikolai Zabotin. In September 1945, hearing that he and his family were to be sent home to the Soviet Union and dissatisfied with the quality of life and the politics of his homeland, he decided to defect. Gouzenko walked out of the embassy door carrying with him a briefcase with Soviet code books and deciphering materials. He initially went to the Royal Canadian Mounted Police, but the RCMP officers on duty refused to believe his story. He then went to the Ottawa Journal newspaper, but the paper's night editor was not interested, and suggested he go to the Department of Justice – however nobody was on duty when he arrived. Terrified that the Soviets had discovered his duplicity, he went back to his apartment and hid his family in the apartment across the hall for the night. Gouzenko, hidden by a neighbour, watched through the keyhole as a group of Soviet agents broke into his apartment. They began searching through his belongings, and left only when confronted by Ottawa police. The next day Gouzenko was able to find contacts in the RCMP who were willing to examine the documents he had removed from the Soviet embassy. Gouzenko was transported by the RCMP to the secret World War II "Camp X", comfortably distant from Ottawa. While there, Gouzenko was interviewed by investigators from Britain's internal security service, MI5 (rather than MI6, as Canada was within the British Commonwealth) and by investigators from the US Federal Bureau of Investigation (as the CIA had not yet been founded). It has been alleged that, though the RCMP expressed interest in Gouzenko, Prime Minister of Canada William Lyon Mackenzie King initially wanted nothing to do with him. Even with Gouzenko in hiding and under RCMP protection, King reportedly pushed for a diplomatic solution to avoid upsetting the Soviet Union, still a wartime ally and ostensible friend. Documents reveal that King, then 70 and weary from six years of war leadership, was aghast when Norman Robertson, his undersecretary for external affairs, and his assistant, H. H. Wrong, informed him on the morning of September 6, 1945, that a "terrible thing" had happened. Gouzenko and his wife Svetlana, they told him, had appeared at the office of Justice Minister Louis St. Laurent with documents unmasking Soviet perfidy on Canadian soil. "It was like a bomb on top of everything else", King wrote. King's diaries assembled after his death were missing a single volume for November 10 to December 31, 1945, according to Library and Archives Canada. Robertson told the Prime Minister that Gouzenko was threatening suicide, but King was adamant that his government not get involved, even if Gouzenko was apprehended by Soviet authorities. Robertson ignored King's wishes and authorized granting asylum to Gouzenko and his family, on the basis that their lives were in danger. In February 1946, news spread that a network of Canadian spies under control of the Soviet Union had been passing classified information to the Soviet government. Much of the information taken then is public knowledge now, and the Canadian government was less concerned with the information stolen, but more of the potential of real secrets coming into the hands of future enemies. Canada played an important part in the early research with nuclear bomb technology, Canada along with the UK being part of the wartime Manhattan Project, and that kind of vital information could be dangerous to Canadian interests in the hands of other nations. Gouzenko's defection "ushered in the modern era of Canadian security intelligence". The evidence provided by Gouzenko led to the arrest of 39 suspects, including Agatha Chapman, whose apartment at 282 Somerset Street West was a favourite evening rendezvous; a total of 18 were eventually convicted of a variety of offences. Among those convicted were Fred Rose, who was the only Communist Member of Parliament in the Canadian House of Commons; Sam Carr, the Communist Party's national organizer; and scientist Raymond Boyer. Chapman was later acquitted; the judge in her case announced that "No case has been made out and, as far as this trial is concerned, the accused is dismissed." A Royal Commission of Inquiry to investigate espionage, headed by Justices Robert Taschereau and Roy Kellock, was conducted into the Gouzenko Affair and his evidence of a Soviet spy ring in Canada. It also alerted other countries around the world, such as the United States and the United Kingdom, that Soviet agents had almost certainly infiltrated their nations as well. Gouzenko provided many vital leads which assisted greatly with ongoing espionage investigations in Britain and North America. The documents he handed over exposed numerous Canadians who were spying for the Soviet Union. A clerk at the External Affairs, a Canadian Army captain, and a radar engineer working at the National Research Council were arrested for espionage. A spy ring of up to 20 people passing information to the Soviets led by Communist Party MP Fred Rose was also exposed. In the United States the FBI tracked down a Soviet spy Ignacy Witczak at the University of Southern California (USC) in Los Angeles. Gouzenko and his family were given another identity by the Canadian government out of fear of Soviet reprisals. Gouzenko, as assigned by the Canadian government, lived the rest of his life under the assumed name of George Brown. Little is known about his life afterwards, but it is understood that he and his wife settled down to a middle-class existence in the Toronto suburb of Clarkson. They raised eight children together. He was, however, involved in a defamation case against Maclean's for a libellous article written about him. The case was eventually heard by the Supreme Court of Canada. Gouzenko remained in the public eye, writing two books, This Was My Choice, a non-fiction account of his defection, and the novel The Fall of a Titan, which won a Governor General's Award in 1954. 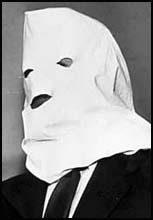 Gouzenko also appeared on television to promote his books and air grievances with the RCMP, always with a hood over his head. Gouzenko died of a heart attack in 1982 at Mississauga, Ontario, Canada. Svetlana died in September 2001 and was buried next to him. His grave was unmarked until 2002, when family members erected a headstone. In June 2003, the city of Ottawa and in April 2004, the Canadian federal government put up memorial plaques in Dundonald Park commemorating the Soviet defector. It was from this park that RCMP agents monitored Gouzenko's apartment across Somerset Street the night men from the Soviet embassy came looking for Gouzenko. The story of the Gouzenko Affair was made into the film The Iron Curtain in 1948, directed by William Wellman, with screenplay by Milton Krims, and starring Dana Andrews and Gene Tierney as Igor and Anna Gouzenko, produced by Twentieth Century Fox. ^ "Soviet Defector Believed Beginner of Cold War". Toledo Blade. December 25, 1984. Retrieved July 23, 2012. ^ Hicks, Granville (July 18, 1954). "Decline and fall of a Russian idol" (PDF). The New York Times. Retrieved July 29, 2012. ^ Сколько стоит продать Родину, Дмитрий Прохоров, Olma Media Group, 2005. ^ a b c Knight, Amy (2005). How the Cold War Began: The Igor Gouzenko Affair and the Hunt for Soviet Spies. New York: Carroll & Graf Publishers. pp. 14, . ISBN 978-0-78671-816-0. ^ Pincher, Chapman (2009). Treachery: Betrayals, Blunders and Cover-ups: Six Decades of Espionage Against America and Great Britain. New York: Random House. p. 11. ISBN 978-1-4000-6807-4. The volume which contained entries from November 10 to December 31, 1945 is missing. It was not with the other diaries which were assembled after Mr. King's death in July 1950, and is the only volume in the entire period 1893 to 1950 which has not been accounted for. ^ a b c d Finkel, Alvin. Conrad, Margaret (2002). History Of the Canadian People: 1867 to Present. Toronto:Addison Wesley Longman Publishing, p. 347. ^ "The RCMP Takes Over". Canadian Security Intelligence Service. Archived from the original on June 2, 2008. Retrieved October 31, 2008. ^ a b "The trial and tribulations of Miss Agatha Chapman: statistics in a Cold War climate". The Free Library. Retrieved February 28, 2014. ^ Raymond Boyer, Canada's Human Rights History, (C) Dominique Clément. ^ Woods, Allan (January 20, 2012). "Jeffrey Paul Delisle is hardly the only spy Canada has caught". Toronto Star. Retrieved March 21, 2013. ^ Mike Gruntman. "1". Enemy amongst Trojans : a Soviet spy at USC. Figueroa Press. p. 1-10. ISBN 9781932800746. ^ Doug Baldwin; Don Quinlan; Rick Mahoney; Kevin Reed (2008). The Canadian Challenge. Toronto: Oxford University Press Canada. p. 147. ISBN 978-0-19-542647-2. ^ Lefolii et al. v. Gouzenko,  S.C.R. 3. ^ "Gouzenko honoured by plaque in Ottawa". CBC News. Archived from the original on January 21, 2008. ^ "Канада отдала дань перебежчику Гузенко". April 15, 2004 – via bbc.co.uk. "The Defection of Igor Gouzenko: Report of the Canadian Royal Commission" (Intelligence Series, Vol. 3, No. 6), Aegean Park, 1996. ISBN 0-89412-096-4. Amy Knight, "How the Cold War Began: The Igor Gouzenko Affair and the Hunt for Soviet Spies", Carroll & Graf, 2006. ISBN 0-7867-1816-1. J. L. Black & Martin Rudner, eds., "The Gouzenko Affair", Penumbra Press, 2006. ISBN 1-894131-91-6. Sawatsky, John, "Gouzenko: the untold story", Gage Publishing Ltd., 1984. ISBN 0-7715-9812-2. Granatstein, J. L., & Stafford, David, "Spy Wars", Key Porter Books Ltd., 1990. ISBN 1-55013-258-X. Stevenson, William, "Intrepid's Last Case". Gouzenko, Igor, "This was My Choice", Eyre & Spottiswoode, London, 1948. Sawatsky, John, "Men in the Shadows", Totem Books,1983. ISBN 0-00-216821-9. Pickersgill, J. W., and Forster, O. F., eds., "The Mackenzie King Record", Toronto: The University of Toronto Press, 1970, Volume III. Clément, Dominique, "Canada's Rights Revolution", Vancouver: UBC Press, 2008. Mike Gruntman. "1". Enemy amongst Trojans : a Soviet spy at USC. Figueroa Press. p. 1-10. ISBN 9781932800746. "Spy vs. Spy; What Igor Gouzenko taught the West", review by Harvey Klehr of "How the Cold War Began; The Igor Gouzenko Affair and the Hunt for Soviet Spies", in The Weekly Standard, December 18, 2006. In Canada, the 1954 Governor General's Awards for Literary Merit were the eighteenth such awards. The awards in this period had no monetary prize but were an honour for the authors. Bower Featherstone was a Canadian civil servant who was convicted of espionage in 1966.Featherstone was a lithographer who worked for the Department of Energy, Mines and Resources.A promising young officer in the RCMP Security Service, Gilles G. Brunet, played a significant role in his conviction, work for which he won a promotion. His handler was Eugen Kourianov. According to Nigel West Kourianov was suddenly recalled to the Soviet Union, suggesting a mole had tipped of the Soviets. Decades later western intelligence learned that Brunet, the young officer who won promotion for his work in convicting Featherstone, had also been a mole. The main document he was convicted of handing over to the Soviets was a confidential chart of two shipwrecks southeast of Newfoundland. Although he was convicted of violating Canada's Official Secrets Act none of the documents he passed on was actually secret. Featherstone was the first individual to be convicted under the Official Secrets Act since the trials that followed the defection of Igor Gouzenko in the lat 1940s.Featherstone received a 30-month sentence, and served 10 months—2 months in the maximum security Collin's Bay Penitentiary, and 8 months at a minimum security forestry camp—before he was paroled. In June 2003, the City of Ottawa and in April 2004, the Canadian federal government put up memorial plaques in Dundonald Park commemorating the Soviet defector, Igor Gouzenko. It was from this park that Royal Canadian Mounted Police agents monitored Gouzenko's apartment across the street on the night men from the Soviet embassy came looking for Gouzenko. The memorial plaques are the result of four years of effort by history enthusiast Andrew Kavchak, who first came across Gouzenko's case, and decided that "the first major international event of the Cold War" deserved a memorial. The Federation of Russian Canadians is a left-leaning cultural organization for Russian immigrants to Canada and their descendants. It is the successor of the Russian Farmer-Worker Clubs which were closed by the government at the beginning of World War II as a suspected subversive organization due to its links with the Communist Party of Canada. In 1942, after the Nazi invasion of the USSR, the organization reappeared as the Federation of Russian Canadians, known also by its Russian initials as the FRK.At its height, the FRK had 15 branches across Canada and published a newspaper, Vestnik. In 1944, the organization had around 4,000 members but, as a result of the Cold War and the defection of Igor Gouzenko that number fell to 2,709 by 1949. In the late 1980s the group had less than 800 members.While Vestnik ceased publication in 1994, the FRK still has community centres in Toronto and Vancouver. The FRK organized some 15 branches in various Canadian cities and published the newspaper Vestnik (Herald), long the only Russian newspaper in Canada.The FRK was associated with the Labor-Progressive Party and was affiliated with the Canadian Peace Congress. Fred Rose (born Fishel Rosenberg; December 7, 1907 – March 16, 1983) was a Canadian politician and trade union organizer. A member of the Communist Party of Canada and Labor-Progressive Party, he is best known as the only member of the Canadian Parliament ever convicted of a charge related to spying for a foreign country. The decades following the rebellions of the Canadas marked the beginning of intelligence services in Canada. Defeat in the failed uprising caused the restoration of colonial regimes and the reform of imperialism. As a result, informal intelligence services were formed to conduct certain activities. 1864 marked the formation of two secret police forces and the formal intelligence service in Canada. Created to protect the Canada–United States border, these organization were under the control of a Montreal police commander and political ally. In response to a number of raid and attacks connected with Irish nationalism, Prime Minister John A. Macdonald merged the two forces to form the Dominion Police (DP). The DP was subsequently merged with the North-West Mounted Police to form the Royal Northwest Mounted Police in 1904 and the Royal Canadian Mounted Police (RCMP) in 1920. During the World War II period, ties with allied intelligence strengthened. Canadian intelligence services, usually following in the way that the British collect information, began to follow the ways of the United States' system; new governmental committees were established and Canadians served in a variety of intelligence capacities, both home and abroad. Camp X, a secret training facility in Ontario, in an example of such joint activities. The camp lead to the establishment of the Communications Security Establishment, scientific cooperation in the Manhattan Project and the establishment of the first biological germ warfare station. The 1945 defection of Soviet cipher clerk, Igor Gouzenko served as the catalyst of major structural reform to the security and intelligence system and lead to the formation of one of several royal commissions to investigate the activities of foreign intelligence networks in Canada. Recognition came to the RCMP's Intelligence Section when it was elevated to branch status and then re-established as the Directorate of Security and Intelligence or the "I" Directorate. Following a 1969 report, the DSI became the RCMP Security Service and was further elevated from regional-level division to national-level division giving the director even more power. In 1984, the RCMP Security Service was disbanded to make way for the Canadian Security Intelligence Service. This reform was caused by a report released by the McDonald Commission in 1981. The Department of National Defence and the Canadian Forces have two main agencies responsible for providing intelligence: the Communications Security Establishment, which is responsible for the signals intelligence aspects of military intelligence and the Intelligence Branch which is the main intelligence service of the Canadian Forces. The Int Branch, as it is sometimes referred as, conduct operations both home and abroad to provide correct and up-to-date information to defence operation planners and commanders. The Kellock–Taschereau Commission (officially the Royal Commission to Investigate the Facts Relating to and the Circumstances Surrounding the Communication, by Public Officials and Other Persons in Positions of Trust of Secret and Confidential Information to Agents of a Foreign Power) was a royal commission appointed by Prime Minister William Lyon Mackenzie King on behalf of the Government of Canada under Order in Council PC 411 on February 5, 1946. The Commission was mandated to investigate the allegations set forward by Soviet defector Igor Gouzenko that a spy ring of Canadian Communists was handing over secret information to the Soviet Union, later referred to as the "Gouzenko Affair". Notable among the thirteen accused of passing over secrets were Fred Rose, the Labor-Progressive Party Member of Parliament for Cartier, and Sam Carr, a senior organizer of the Labor-Progressive Party. The commission was headed by two judges of the Supreme Court of Canada, Justice Robert Taschereau and Justice Roy Kellock. Counsel included President of the Canadian Bar Association E.K. Williams, D.W. Mundell, Gérald Fauteux, and John Robert Cartwright. The Commission was hurriedly convened when rumours in Washington suggested journalist Drew Pearson was about to disclose that Canada was secretly investigating Russian spy rings that might extend into the USA. Several Canadians named in Gouzenko's documents were immediately arrested and sequestered until summoned before the royal commission. Evidence before the commissioners suggested at least two Soviet espionage networks were active in Canada in wartime, one targeting the Manhattan Project. About 20 Canadian suspects were tried in 1947-48 for espionage. Ten were convicted and punished in a range from five years imprisonment to a $500 fine, seven were judged not guilty and two more acquitted on appeal. British nuclear scientist Alan Nunn May was arrested in England in March, 1946 and pleaded guilty; British nuclear scientist Klaus Fuchs remained at work undetected until identified by Venona in 1949. The impact of the Kellock–Taschereau Commission was far-reaching, first because people implicated in Gouzenko's documents were secretly arrested and denied legal advice, under emergency wartime regulations, and an "Emergency Committee for Civil Rights" assembled to defend them. Executive members included C.B. Macpherson, Leopold Infeld and A.Y. Jackson. Their advertisement in the Toronto Star said the Commission endangered the "basic rights of Canadians" and did "violence to the rights of free men." They compared the Kellock–Taschereau Commission to the trial of Lt.-Col. John Lilburne during the English Civil War of 1649, stating "the methods of the Commission are not new. They were used against Englishmen in 1649 and against Canadians in 1946. "Whatever the implications for civil and legal rights, the "Gouzenko inquiry" provided the first judicial evidence in North America of proved Communist spies, among the first events of the Cold War, and prompted both increased investigation (which discovered such spies as Julius and Ethel Rosenberg) and McCarthyism. In the Literary Review of Canada, Margaret Atwood listed the report of the Kellock–Taschereau Commission as one of Canada's 100 most important books. Many later writers on espionage cite its evidence as the first detailed narratives of how Soviet agents cultivated sympathetic acquaintances so as to turn them into active spies on secret topics. Gordon Lunan, one of the spies most harshly punished (5 years in prison) later published personal memoirs. Operation Manhunt is a 1954 American drama film directed by Jack Alexander and written by Paul Monash. The film stars Harry Townes, Irja Jensen, Jacques Aubuchon, Robert Goodier, Albert Miller and Caren Shaffer. The film was released on October 4, 1954, by United Artists. Sir Roger Henry Hollis, KBE, CB (2 December 1905 – 26 October 1973) was a British journalist, and an intelligence officer who served with MI5 from 1938 to 1965. He was Director General of MI5 from 1956–1965. Sam Carr (July 7, 1906–1989) was an organizer for the Communist Party of Canada and, its successor, the Labor-Progressive Party in the 1930s and 1940s. He was born Schmil Kogan in Tomashpil, Ukraine in 1906 and immigrated to Canada in 1924, living in Winnipeg and Regina before settling in Montreal in 1925. Carr became an organizer for the Young Communist League with Fred Rose.In 1931, Carr was arrested with other Communist Party leaders and detained in Kingston Penitentiary for 30 months for being an officer in the party, which had been initially declared illegal in 1931. Following his release from prison he was an organizer of the 1935 On to Ottawa Trek.He was the editor of the Communist Party's newspaper, The Clarion, before fleeing to the United States with other party leaders in 1940 when the party was again declared illegal. When the Soviet Union became an ally later in the war as a result of the German invasion of the USSR, those party leaders such as Carr and Tim Buck who had gone underground turned themselves into the authorities in 1942 and were released after ten days on the promise that they would refrain from communist activities. As a result, the Labor-Progressive Party was formed in 1943 as a legal front for the party - Carr became its national organizer.In 1946, after a cypher clerk in the Soviet embassy in Ottawa, Igor Gouzenko, defected to Canada, a warrant was issued for Carr's arrest and he again fled to the United States. A Royal Commission on Espionage was called to investigate his activities. In 1949 he was found guilty of conspiracy to obtain a false passport, and was imprisoned for seven years. Carr was one of the principal recruiters of spies for the USSR in Canada.Upon his release from prison Carr was no longer a member of the party but became active in the left wing progressive organization, the United Jewish Peoples' Order (UJPO), until his death in 1989. He wrote for the UJPO magazine under the pen name George Lewis.